The weekend I moved to New York, I walked around my new neighborhood with my parents to familiarize myself with the stores and businesses around me. I learned where the closest subways stops were, which Duane Reade was open 24 hours and most importantly where to get good meals.Nothing makes you feel more at home than eating well. By eating well, I don’t just mean eating healthily though that is, of course, ideal. Eating food that tastes good makes you happy. It also helps if you didn’t have to spend an arm and a leg to get that food. My first Saturday in the city, my parents and I stopped for lunch at Goodburger. It is slightly more expensive than a fast food burger and fries combo but the quality of the food is so much better. The burgers and shakes are wonderful, as advertised but my personal favorite is their crab cake sandwich. I’m kind of obsessed with crab cakes. I eat them everywhere and have high standards for them. The crab cake sandwich at Goodburger is awesome. The crab meat is just lumpy enough and the remoulade tastes great. Finding something familiar in a new place is a great way to feel at home. Last semester, I became a regular at the Goodburger on Maiden Lane. I’m somewhat of a habitual food eater so if I like a restaurant, I’ll probably be back about once a week. One night, I dropped in right before closing. They made my food fresh in front of me like always and then threw in a free cookie. No explanation was given. I like to think I won an unofficial favorite customer award. Now, I can’t guarantee free cookies but Campus Clipper provides a coupon that will give you 10% off your order with your student ID. This offer is valid at all of their 6 locations in Manhattan. My biggest passion in life is comedy. It’s like I have some cancer that makes me seek out everything that’s funny. In fact, that’s why I came to New York City—it’s the mecca of comedy, from stand up to improv, it’s here. I started performing stand up comedy last year, and there’s no greater sensation in the world. It’s terrifying and utterly liberating all in the same moment. Just making one person laugh, one time, is a huge reward. I’ve become addicted to the sound of laughter I receive after I get through telling a story or making a witty remark (maybe people are just laughing at me). I’m so in love with the comedy found in NYC that it’s not funny. Seriously. It’s ironic that the thing I’m most serious about in life is something that’s far from it. I urge everyone to dive into the comedy scene, whether you’re performing or enjoying (or both), because everybody needs a little more laughter in life. Go out and do something, like stand up shows, improv shows, or karaoke. What better way to laugh than at your friends trying to belt out lyrics from The Spice Girls? 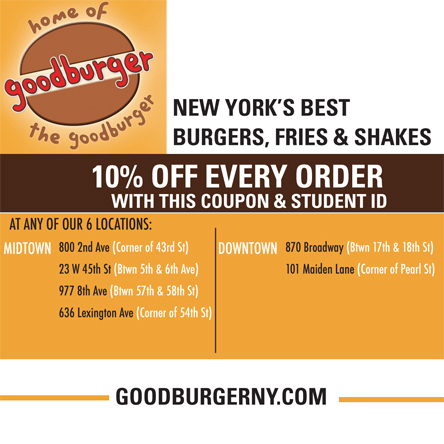 Finding fun NYC student discounts makes a good time even better, knowing that you’re saving cash! Joking aside, with a quick web search you can find loads of cheap or free comedy shows all across the city. 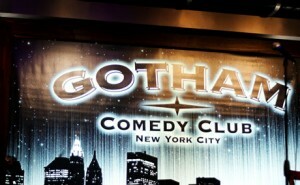 My favorite, Gotham Comedy Club, hosts a free open mic every Monday; a very cool venue to check out. 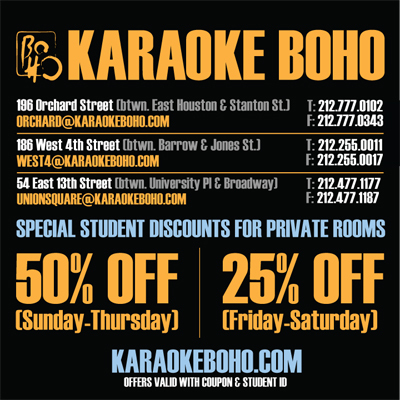 Also, if a hilarious night of karaoke with some close friends hits your funny bone, then I found a great coupon for “Karaoke Boho” in the Campus Clipper for 50% Sunday-Thursday and 25% Friday-Saturday. Don’t forget your student ID for an awesome NYC student discount! I’m young and I’m in New York City– there’s a million shows for me to see, all within my reach. Movies and comedy shows are my kryptonite, and I’m almost always willing to catch a flick or a cheap show, unless I’m in bed watching a movie. The second show I saw this week was an Improv show over at UCBT (Upright Citizens Brigade Theatre). I was in tears, had stomach cramps, and couldn’t breathe– all from laughing so hard. There’s no doubt that NYC is the place to be for comedy, and I certainly hit the funny bone at UCB. The group I saw perform was “The Law Firm,” which is a group that’s been together for a while and has gained in popularity. They asked someone from the crowd to tell a story from their week and then they acted out a series of completely unrehearsed, improvised scenes based on that person’s story. It was pure comedic genius! The show seemed to include everybody in the crowd, feeding off laughter and listening to scene suggestions throughout the show, which was great to feel a part of such a funny experience. Plus, all their shows are dirt cheap, ranging from $5 during the week and $10 on the weekends. Talk about great NYC student discounts! The city is tough, and coming from a girl who self-proclaims that she can handle anything, that’s saying a lot. Things went wayward when upon my arrival my roommate backed out of the lease we were all set to sign. It was Thursday, her lease ended Tuesday, I started work Monday, and I had no place to live. My four-day plan to unpack, unwind and explore my new city of residence was thwarted and replaced by stress, tears, uncertainty and the strong possibility of being homeless in the immediate future. I searched and searched and searched for hours and days on end until I found a solution. I’m now subletting an apartment in Chinatown for a month, and my roommate is a 29-year-old Swedish man who works in an art gallery. Throughout the ordeal, all I can remember is longing for the days when my parents could fix everything for me. But, seeing as Mom is in Jacksonville, Fla. and Dad is in San Francisco, it would have been even more work for them than it was for me. And let me just say, it was work—hard, grueling, frustrating work. But, everyone in New York City is working hard, working tirelessly, and students aren’t the exception. In a city that revolves around hard work, it’s easy to forget to pamper yourself every once in a while. In such an expensive city, though, budgets often leave no room for a little pampering, and I could definitely use some. Do yourself a favor and pick up a Campus Clipper coupon book. The Beauty and Youth Salon + Spa is offering special student packages such as $15 manicure and 10-minute massage and $25 for a chocolate manicure and pedicure. Receive peace of mind for a lot less. Interested in more deals for students? Sign up for our bi-weekly newsletter to get the latest student discounts and promotions. For savings on-the-go, download our printable coupon e-book! Who Can Turn Down a Free Pint of Ice Cream? I have an addiction, and it’s receiving free stuff for stuff that I was going to buy anyway. Free shipping for spending $25 online at American Eagle? Sure. Free gift bag full of goodies from Clinique for buying the foundation I needed anyway? Heck yes! People say nothing is ever free. I choose to ignore them. I have another addiction, and it’s ice cream. It doesn’t matter how cold it is outside or what time of day it is, I could always go for a bowl of Rocky Road or French Vanilla with chocolate syrup and sprinkles (or both!). The best part of New York is even ice cream parlors deliver. You don’t even have to step out into the cold to get your fix of frozen sweetness. Check out the Campus Clipper coupon book for a Haagen-Daaz deal: a free pint of ice cream with your first delivery order of $10 or more. What a yummy deal!